Originally she was Baba from Eastern Europe. Autumn was her season for she lived in the last sheaf of corn. The woman who consumed it would become pregnant within a year. Baba became the fearsome Baba Yaga of Russia. She lived deep within a birch forest. Her house was surrounded by a fence of bones with human skulls atop it and a lock that was a mouth full of sharp teeth. Her house turned on chick legs. 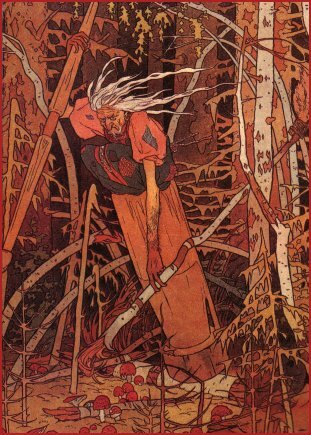 Baba Yaga became the evil witch that ate children and scared men to their deaths. It was written her mouth stretched from Earth to the gates of Hell. 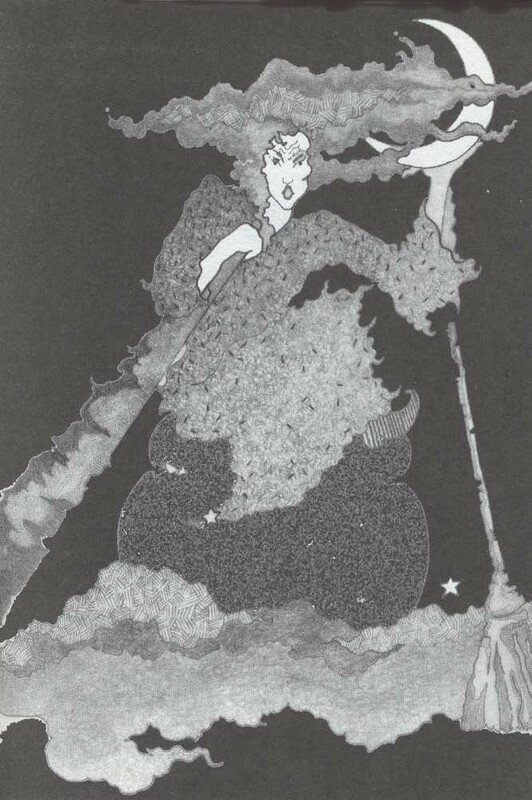 She flew through the air with a mortar and pestle sweeping the trail with a broom. But let us look closer. She is not only the Goddess of the underworld, but also the guardian of the fountain of the waters of life. Baba Yaga not only is the Goddess of death, but also the Goddess of life. At dawn, a white horseman leaves her residence. When noon arrives, a red horseman leaves her residence. And finally, at dusk, a black horseman leaves her residence only to have the cycle begin again at dawn. The signs of the triple Goddess remain. If you were to ask Baba Yaga she would tell you these were not men, but amazons that rode the horses. Baba Yaga's lineage is not known. When asked how she feels about being made into an evil hag, the grandmother of the devil, a demonic witch, Baba Yaga explains at least she was kept alive so when someone wished to seek her out she could be found. 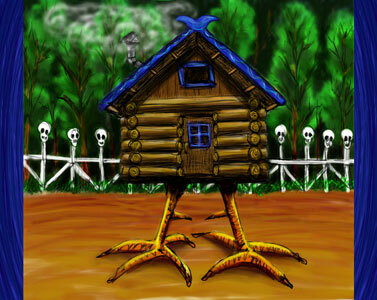 Baba Yaga believes this image keeps many of the unwanted away. Even writers who spoke of her evil side also would speak of her giving side. She does not associate with men at all and believes they distorted her image out of fear. 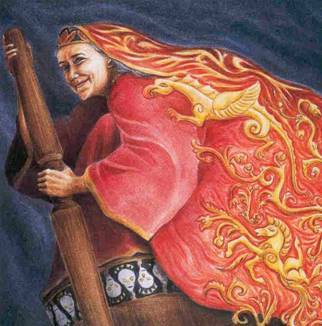 Baba Yaga is a woman's Goddess and associates herself not only with the Crone, but also with the Amazon. She is considered a wise old woman, even by those who fear her. Baba Yaga is a Crone Goddess so it is best to invoke her for banishing rituals. It is easy to include her in your spells and rituals. Place a mortar and pestle on your altar to represent her. Burn white, red, and black candles if you do not own a mortar and pestle or just for some extra Baba Yaga power. Baba Yaga recognizes that it is difficult to banish unwanted traits/behaviors and suggests spinning in a circle with your arms out until you are dizzy before any banishing spell. If you are unable to physically spin then spin in a meditation. As you spin, name the traits you wish to let go of. This exercise will help minimize the defenses we use to hold onto negative behavior. But remember if you can not do this safely in your physical space, then do it in a meditation. She is also a wonderful Goddess to use during empowerment spells. During the full moon wear her colors and chant this affirmation, "I am a witch. I have the power to change the things I do not like in my life. I find out what I want and need and I give it to myself. I no longer hide my beliefs and talents to protect others. I speak up. I enjoy every witch way I am." (1) Feel free to change it to suit your purposes. The purpose is to meet Baba Yaga so you my get to know the true Goddess. This meditation is best done during the dark moon. It is a solitary medition best done alone. Cast a circle if you like or just get comfortable in you favorite meditation position. Make sure the room is dark and you will not be disturbed. Now let us begin. You have entered a thick forest, but some how you know your way. You reach an opening in the trees. There before you is the home of the Goddess Baba Yaga. The fence is made of bones topped with human skulls. The house dances on chicken legs. It is a fearsome sight, yet you know there is nothing to fear. You reach the gate and ring the bell for her. In a harsh voice she asks what you want. With a pure heart you tell her why you wished to meet her. She flies out of her house in her mortar to greet you. How are you feeling? What are your impressions? Baba Yaga approaches and asks you to come with her for a ride. Do you hesitate? Go with her. Fly through the air in the mortar with Baba Yaga. Take note to where she takes you and what she tells you. Enjoy the feeling of flying! Baba Yaga will know when it is time to come back. When you return to her home, thank her and give her a gift. Does she give you a gift? If so, what is it? You know your way back through the woods. Now you know the way and can visit Baba Yaga when needed. When I rode with Baba Yaga in her mortar the first time she ground me up into little pieces with her pestle. She then sprinkled the waters of life on me and I was back to myself. I felt refreshed, as if the unneeded traits were ground away. 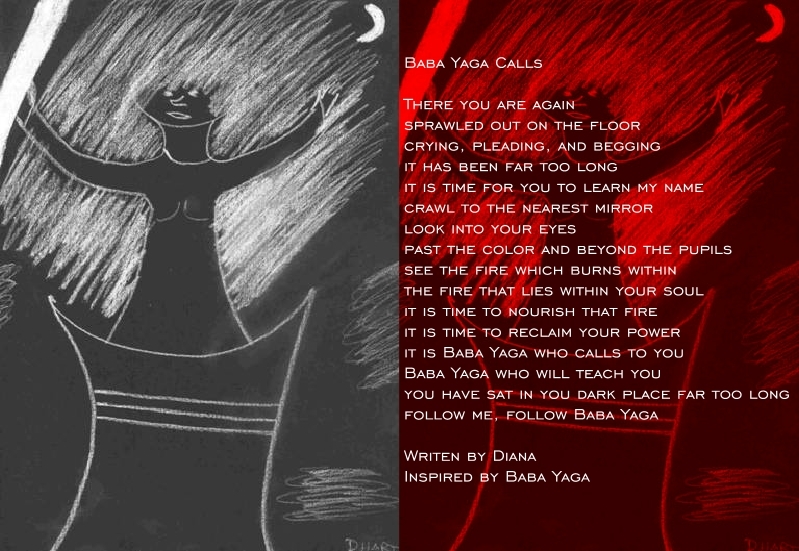 Baba Yaga came to me as a healer. She taught me all healers must be intimately familiar with the cycles of life and death. She remains guardian of both the underworld and the fountain of the waters of life. 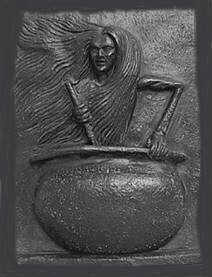 She rides in a mortar with a pestle, this is a tool of an herbal healer. Her colors are white for purity and red for life force, not just black for endings. To any healer, I highly recommend becoming intimately acquainted with a Death Crone. 1. Blair, Nancy Goddesses for Every Season. Element Books, Rockport, 1995. 2. Conway, D. J. Maiden, Mother, Crone: The Myth and Reality of the Triple Goddess. Llewellyn Publications, St. Paul, 1999. 3. Conway, D. J. Moon Magick: Myth & Magic, Crafts & Recipes, Rituals & Spells. Llewellyn Publications, St. Paul, 2000. 4. Monaghan, Patricia. The New Book of Goddesses & Heroines. Llewellyn Publications, St. Paul, 2000. 5. Marashinsky, Amy Sophia. Illustrated by Hrana Janto. The Goddess Oracle: A Way to Wholeness Through the Goddess and Ritual. Harper Collins, UK, 1997. 6. Telesco, Patricia. 365 Goddess: A Daily Guide to the Magic and Inspiration of the Goddess. HarperSanFrancisco, 1998. Thank you Baba Yaga for making yourself known in my life!